Thanksgiving is one of my favorite holidays. It falls on or near my birthday which always compounds the amount of special that this holiday has for me but overall a holiday focused on food, family, friends, and being thankful is kind of perfect. 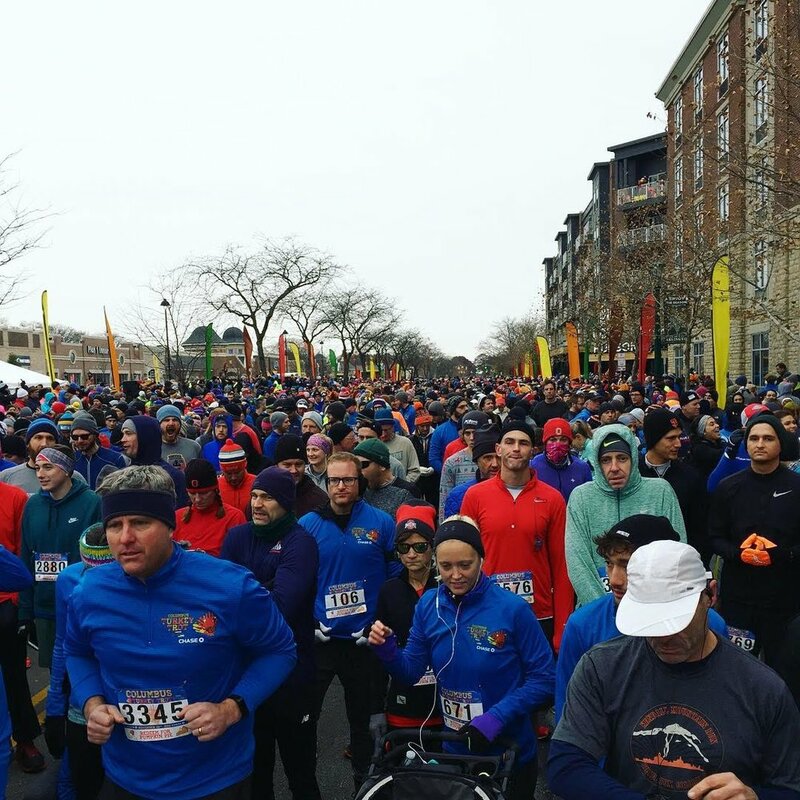 Nearly every year I made the trek back to Ohio to celebrate the day with family and about every other year I join in with my local turkey trot. 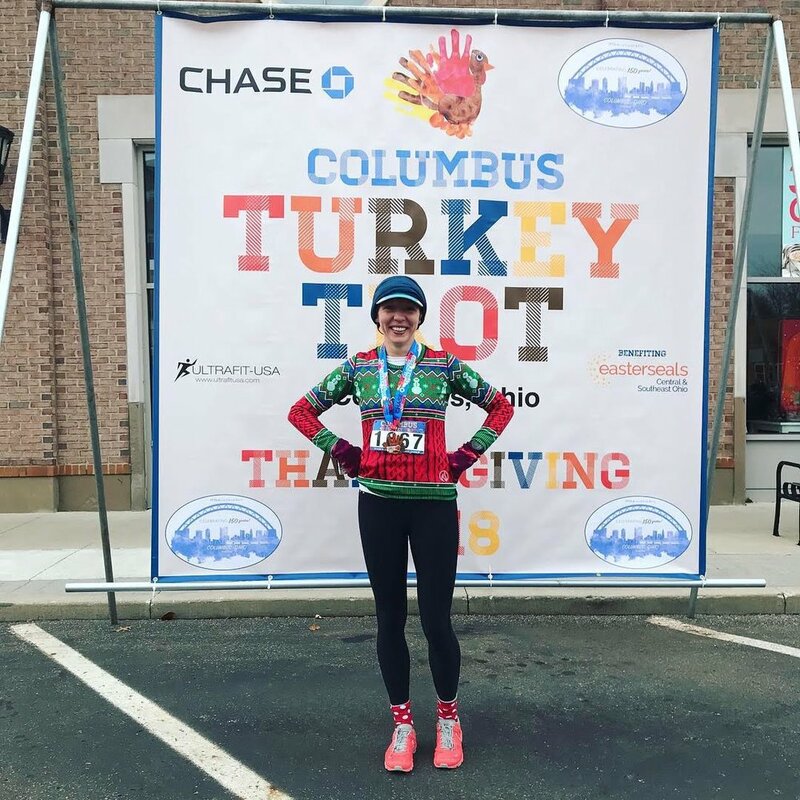 The Columbus Turkey Trot is a 5-mile loop that runs from Upper Arlington through part of OSU campus and then back and every finisher gets a pumpkin pie! Turkey trots are some of my favorite races because they seem to have a fun and festive air to them. Lots of families coming out together and enjoying running while hanging out and catching up. Unfortunately (or maybe fortunately) I’m the only runner in my family so this is a solo venture for me, but that doesn’t mean I love it less. This year I flew into Columbus on Wednesday and swung by the Columbus Running Company store in the Short North. After grabbing my bib, I realized that there was Jeni’s Ice Cream location nearly right across the street so I couldn’t let that opportunity pass me up. Grabbed a pint each of peppermint and coffee ice cream to go. Jeni’s is just the best! I woke up, drank some coffee and had some peanut butter toast and got myself ready to go. I left my parent’s house at 8am, giving myself and hour to run the half hour to the start area and get myself ready to run. The start is in front of the Lane Avenue shops so there were some places open where we could find some shelter from the cold. It was about 30 degrees out. We lined up on Lane Ave and they tried to partition the runners by pace so I put myself right infront of the 8min/mi runners. With a countdown we were off! The first part is a nice downhill on Lane Ave and then we turned and made our way onto OSU campus. They had changed the course since I last ran it so it was more of just an out and back down Woody Hayes Dr which isn’t the most scenic but I was feeling good (and enjoying running at sea level) and so I was just able to take it all in. At the mile 2 marker I was cruising around 7:10 and feeling good. I just tried to keep riding that line of feeling like I as putting in a decent effort without blowing up. I really didn’t want to completely trash my legs from this race since I had some serious Dopey Challenge miles to log over the next couple of days. Everything was going great until we met up with the Walk and Talk 2-milers which I think is a great event but it is VERY annoying that the 5-milers meet up with them at mile 4 on the narrowest part of the course. The new course had us cut through the OSU tree farm on a ~10ft wide path instead of on Lane Ave which is a 4 lane road. Not ideal. After dodging through them for about .5 miles, we got back onto the very wide Lane Ave and that helped really bring it into the finish without too much more darting and weaving. At about mile 3 I knew I was crushing my goal which made the crowded course that much more frustrating but I crossed in 35:22, which was awesome and makes me feel good about potentially going for a sub-45min 10k at the WDW Marathon Weekend. I crossed, grabbed my medal, grabbed my pie (which I promptly donated to the Rescue Mission) and then grabbed some snacks and relaxed for a bit before making the ~3 mile trek home. They had a pretty great post-race spread which I thoroughly enjoyed. Those duplex cookies are the perfect snack after a run and before a cool down run home! Other than the course crowding at mile 4 this was a great race, well run and a festive start to the holiday!